Let me tell you why Chocolate IS good for you! I know with Valentine’s Day coming we all kind of get into the chocolate mood. Or if you’re like me you’re always in the mood! I have to have a little bite each day (or after each meal!) 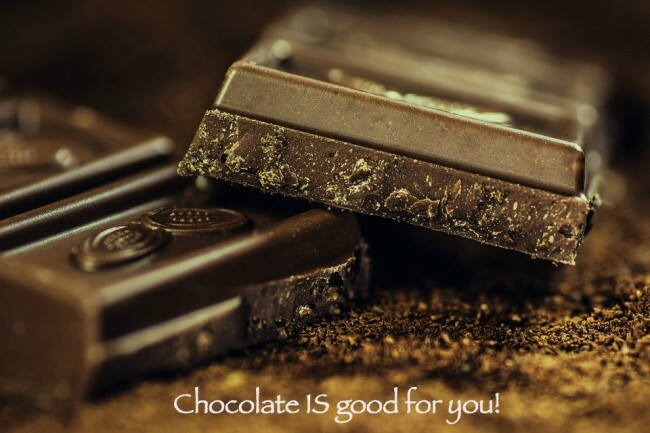 so I thought I’d do a post to let you know that a little bit of DARK chocolate is good for you. Unfortunately, milk and white chocolate have no known health benefits. Here is an interesting fact ~ Dark chocolate contains a large number of antioxidants ~ nearly EIGHT times the number found in strawberries. This is good for our heart. Studies show that by eating a small amount of chocolate each day can lower blood pressure if yours is already high and it’s also been shown to reduce LDL cholesterol (the bad cholesterol) by up to ten percent! 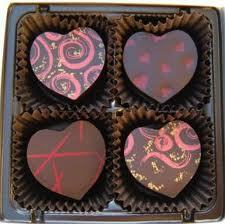 Now chocolate, dark or not, is unfortunately still a high fat food. A bar of dark chocolate has about 400 calories. If you eat only half that bar you must balance those 200 calories by eating less of something else in your day. We can do that, right? I’m going to leave you with one more interesting fact ~ research shows that washing your chocolate down with a glass of milk could prevent the antioxidants being absorbed or used by your body so skip the milk with your bite. Crazy fact huh? My Hubby is in trouble! Are you a chocolate lover? Does knowing dark chocolate has healthy benefits make you feel better? 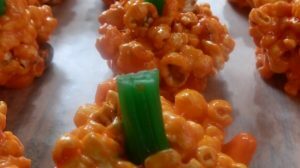 I am getting a sweet craving right now after writing this post! Easter Chocolate at The Mill Fudge Factory ~ 3 Winners! I LOVE dark chocolate! :-D (You might have guessed by my blog's name?) :-) Unfortunately there's something in it that makes my baby grumpy if I eat more than a little square per day. Which is hard for me! LOL!